Prominent bulges in the temporal region are almost always caused by the temporal arteries. The superficial temporal artery comes off the facial artery in the neck and courses upward in front of the ear. Once it reaches a typical landmark point of 1 cm in front of the ear and 2 cms about that point, it bifurcates in to a Y pattern. The front part of this takeoff is the anterior branch of the superficial temporal artery and it continues towards the forehead in a very tortuous pattern. This anterior branch of the temporal artery is fairly superficial and is prone to becoming visibly enlarged. Why it does so is not precisely known but it occurs far more commonly in men. (although it does occur in women as well) It can become quite noticeable with exercise, heat, alcohol intake and a low head position. It can sometimes be associated with temporal headaches as well. When the procedure of temporal artery ligation is considered, what is done for prominent temporal arteries is quite different than the historic approach of simple ligation. The original temporal ligation procedure, also known as a temporal artery biopsy, was done to diagnose arteritis or autoimmune conditions. This is where an incision was made behind the temporal hairline and a section of the artery is removed. This is a single incision which is fairly large by aesthetic standards. The aesthetic temporal artery ligation procedure is a multi-incisional technique that strategically places ligation points at select points along the course of the artery into the forehead. This is always at least two points and often three. 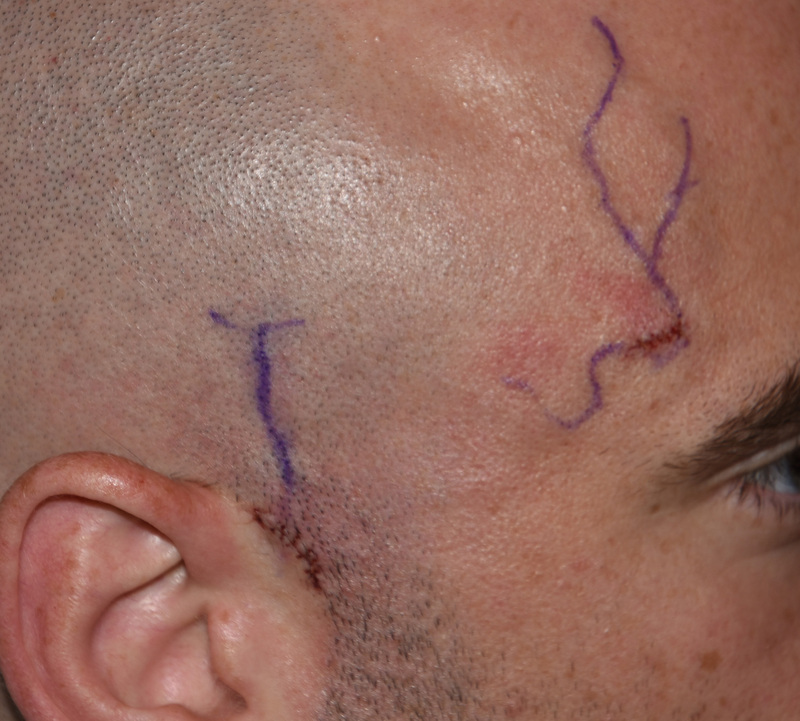 These are very small incisions that take into account the wrinkle lines of the forehead when placed in that location. They heal exceptionally well and leave little to no trace of a scar.